Up to 8.3 million people in the UK are unable to pay off debts or household bills, according to a report from the National Audit Office (NAO). It says that HM Treasury needs to do more to understand the scale of problem debt, and how it impacts people's lives. So what are consumers' options when it comes to borrowing, and how much is the average household debt? There are two major forms of debt when it comes to borrowing money: secured and unsecured. Secured debts are usually tied to an asset. A mortgage is an example of a secured debt - the mortgage loan is secured by the property, and the lender can repossess it if the borrower falls behind on their payments. Unsecured debt, such as a credit card, usually comes with higher interest rates. That is because the lender does not have any rights to tie the debt to an asset. If borrowers cannot make the payments, they might incur additional charges, or could be taken to court by a lender. Problem debt is defined as the inability to pay back debts or household bills. Which is the most common type of debt? Mortgages and credit card spending are the most popular forms of borrowing, according to the latest figures from banking trading body UK Finance. In July 2018, gross mortgage lending for the total UK market stood at £24.6bn, which was 7.6% higher than a year earlier. UK cardholders with cards issued by banks, building societies or non-bank credit providers spent £17.1bn in June 2018. 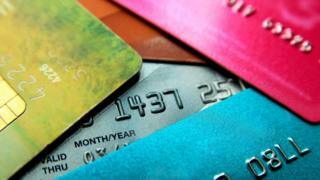 The value of spending on cards issued by UK high street banks was £11.1bn in July - up 8.1% on the previous year. UK Finance said the increase in spending was down to higher retail sales because of the World Cup and the warm weather. New figures from the Bank of England show that credit unions are on the rise. The UK's credit union membership passed two million for the first time, in the first three months of 2018. The average UK household debt (including mortgages) was £58,540 in June, according to financial charity The Money Charity. Overall in the UK, people owed nearly £1.6 trillion at the end of June 2018, up from £1.55tn a year ago. UK households saw their annual outgoings surpass their income for the first time in nearly 30 years in 2017, according to the Office for National Statistics (ONS). The ONS says that consumers are borrowing more and saving less because the bank rate - which dictates returns on savings and the size of loan repayments - has been near a record low for the past decade. According to debt charity StepChange, the number of younger people seeking debt advice has been increasing in recent years. More than 619,000 people contacted the charity for advice in 2017 and most of them were under the age of 40. StepChange clients could fall into one or more of the above categories. Why are payday loans controversial? A payday lender usually offers loans for fewer than 30 days, without a long application process. Payday loans are short-term loans for small sums, designed to tide people over until they next get paid. Payday loan companies have been criticised by debt charities for charging high interest rates and one-off fees to vulnerable customers if they fail to repay their loans on time. The Financial Conduct Authority (FCA) decided to cap the cost of payday loans at 0.8% of the amount borrowed per day and impose a £15 limit on default charges from January 2015. It said that nobody should have to repay more than double the original amount borrowed. It also stressed that loans should only be made to people who were capable of repaying the money. What does the recent increase in interest rates mean for borrowers? The Bank of England raised interest rates from 0.5% to 0.75% in August, making financial conditions better for savers rather than borrowers. Those most affected would include people on a standard variable rate mortgage, whose monthly payment rates are not fixed. The increase could also lead to a rise on rates for other types of borrowing like personal loans and credit cards. For more information and support on debt, visit BBC Action Line.